There is a haiku by Bashō that goes something like “even in Kyoto, I miss Kyoto” (Kyō nite mo kyō natsukashi ya hototogisu). I love Kyoto, and I think I know what Bashō was talking about. Kyoto is a special place. The food is delicious, the city is filled with countless shrines and temples, all sorts of interesting historical stories happened in Kyoto, the tea and vegetables grown just outside of Kyoto are amazing, there’s a vibrant nightlife catering to the students who come to the city’s numerous universities, tons of artists and craftsmen make their homes in Kyoto, and the local sake is out of this world. Almost every grade-school student in Japan gets dragged on a class trip to Kyoto at least once, and even adults make pilgrimages to Kyoto to see the sights (especially during the spring and fall, when the cherry blossoms and maple leaves are at their best). Since Kyoto is only about two hours away from Tokyo by bullet train, the city also has a reputation as a good place to go for romantic getaways and weekend partying. Kyoto is totally awesome, and almost everyone in Japan has been there at least once, so it’s always been surprising to me that there aren’t more manga set there. 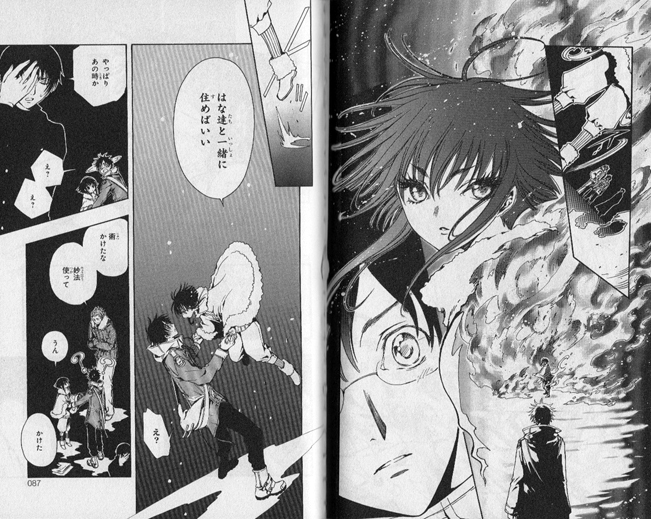 CLAMP’s new fantasy series Gate 7, however, is like a love song to the ancient capital. Gate 7’s teenage protagonist, Takamoto Chikahito, is just as much in love with Kyoto as I am, but he has somehow managed to make it almost all the way up to high school without having ever been there. He saves up enough money to make a solo visit to see the sites; but, on his very first trip to a famous Kyoto shrine called Kitano Tenmangū, he is suddenly transported onto a magical battlefield. Chikahito witnesses a beautiful young warrior with an enormous sword defeat a strange creature before passing out. He wakes in a house near the shrine, where he is attended by the child, named Hana, and her two older companions, Sakura and Tachibana. Sakura, a kind-hearted and cheerful young man involved in the world of geisha and maiko, and Tachibana, a serious and sullen college student, discuss how strange it is that Chikahito was able to enter the magical realm. Tachibana then attempts to erase Chikahito’s memory but fails. In the final coup of strangeness, the androgynous Hana kisses Chikahito and tells him that s/he’ll be waiting. At the beginning of the second chapter (actually the first chapter, as the previous chapter is considered a “prelude”), Chikahito has somehow been transferred to a high school in Kyoto. As soon as he gets off the train that has brought him to the city, he sets off for a famous soba restaurant, where by chance he encounters Hana, who is as happy to see him as s/he is to eat bowl after bowl of noodles. Chikahito is soon dragged into another magical fight with Hana, in which it is revealed that all creatures are affiliated with either light (陽) or darkness (陰). Sakura is affiliated with darkness, Tachibana is affiliated with light, and Hana, for some mysterious reason, can fight using the power of either. By the end of the day, Chikahito finds himself invited to live with the trio in a traditional Kyoto townhouse in the Ura-Shichiken district (the hidden side of the Kami-Shichiken neighborhood around Kitano Tenmangū), an invitation which he ends up accepting, to his own consternation. It turns out that, during their first meeting, Hana had cast a spell on Chikahito that would cause him to return to the Ura-Shichiken. The second and third chapters of the volume develop this fantasy version of Kyoto a bit further. The reader learns, for example, that major historical figures have been reincarnated in our own time, and that these personages are battling over both the position of head of their respective families and the possession of the legendary familiar spirits called “oni” that are connected to these positions. Chikahito also learns that Hana unique in not being affiliated with light or darkness, and that he is special in the same way. Furthermore, he can see oni, which normal humans cannot. In other words, there’s a lot going on behind the scenes in Kyoto that most people don’t know about, and Chikahito has somehow found himself right in the middle of a conflict spanning hundreds of years and multiple dimensions. Chikahito is appealing as a hapless yet loveable protagonist, much like Hideki from Chobits. Also reminiscent of Chobits is the character Hana, who occupies a strange liminal position between ontological dualities. Is Hana a boy or a girl? Is s/he a child or an adult? Is s/he a person or a pet? Is s/he innocent and weak or completely in command of the situation? Is s/he even remotely human? There is a lot of magic and mystery contained between the pages of Gate 7, as well as some interesting historical revisionism. The series plays with questions such as: What if Buddhist magic (妙法), as well as the principles underlying Taoist divination and geomancy, were real? What if the Shinto gods were real? What if the major figures of Japanese history were somehow more than human? The city of Kyoto, with its temples and shrines and traditional houses and narrow alleys and delicious soba restaurants, provides a pitch-perfect backdrop to the story. At the end of the volume is a section called “Wandering Around Kyoto” (ぶらり京めぐり), which provides addresses, websites, and other information about the real locations visited by the characters. Dark Horse has the North American rights to the manga, and I hope they’ll include lots of Kyoto trivia (as well as historical and cultural information) in their own translation notes when they release the first volume this October. Gate 7 is shaping up to be a good story, and it’s interesting just as much for its setting and its take on history as it is for its fights and its handsome male characters. Previous Post What Is Moe? My interest in Gate 7 was only a shallow one until reading your review. 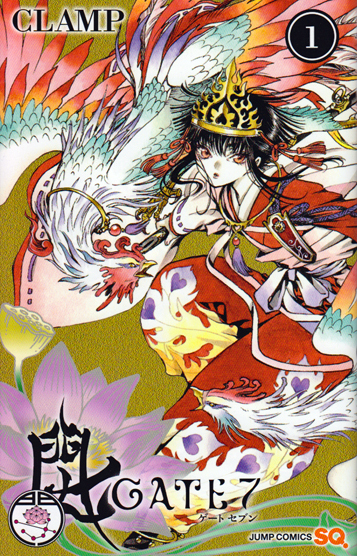 I had no idea how deep the story and worldbuilding was, and anything by CLAMP that can take the best parts of Tsubasa and XXXHOLiC without becoming boring is a win. Plus Chikahito looks vaguely like Watanuki. Thank you for this review! Thank you for your comment! Gate 7 *is* the best of both worlds, but I can’t help but wonder where it’s going. Of course I’ll read it even if it ends up being a redigested mash of CLAMP tropes, but I’m hoping that it’s able to go beyond those tropes and break new ground. I have a lot of faith in the setting and alternative history to help make the series fresh, unique, and interesting. I am now subscribed to your blog, by the way. I love your writing!